In a DER SPIEGEL interview, French President Emmanuel Macron talks about his first months in office, elaborates on his plans for Europe and discusses his developing relationship with German Chancellor Angela Merkel. DER SPIEGEL: MR. PRESIDENT, SINCE ENTERING OFFICE IN MAY, YOU HAVE MADE SIGNIFICANT WAVES AROUND THE WORLD. THE GERMAN PHILOSOPHER GEORG WILHELM FRIEDRICH HEGEL, WHO YOU READ DURING YOUR UNIVERSITY STUDIES, ONCE DESCRIBED NAPOLEON BONAPARTE AS "THE WELTGEIST ("WORLD SPIRIT") ON HORSEBACK." DO YOU BELIEVE THAT A SINGLE PERSON CAN, IN FACT, STEER HISTORY? Macron: No. Hegel viewed the "great men" as instruments of something far greater. It should be said that in referring to him in that way, he wasn't being particularly nice to Napoleon, because he of course knows that history can always outflank you, that it is always larger than the individual. Hegel believes that an individual can indeed embody the zeitgeist for a moment, but also that the individual isn't always clear they are doing so. DER SPIEGEL: HOW MUST A PRESIDENT, A POLITICIAN, BEHAVE TO MOVE THINGS FORWARD AND TO CHANGE HISTORY? Macron: Personally, I don't think it's possible to do great things alone or through individual actions. On the contrary, I think it is only possible to know what to do in a specific moment once you have understood the zeitgeist, and it is only possible to move things forward if you have a sense of responsibility. And that is exactly the goal I have set for myself: to try to encourage France and the French people to change and develop further. But that can only be done as a collective, with one another. You have to bundle the strength of those who want to take that step. The same is true for Europe. DER SPIEGEL: NEMO ... DID YOU NAME HIM THAT? Macron: Yes. He was abandoned as a puppy and spent a year in an animal shelter. I had decided that I wanted a dog from an animal shelter. Normally, presidents have purebred dogs, but he is a Labrador-griffon mix. Absolutely adorable. Quite a stroke of fortune, isn't it? From the animal shelter to the Élysée Palace. I quite like the idea, even if he has little idea where he has ended up. DER SPIEGEL: YOU HAVE LIVED FOR THE LAST FIVE MONTHS HERE IN THE ÉLYSÉE, AN ALMOST MYTHICAL PLACE. DO YOU FEEL THAT YOU HAVE CHANGED AT ALL? INFALLIBILITY? MEGALOMANIA? Macron: I try to follow certain rules. Nothing here should become habitual, because routine lends one a deceptive feeling of security. You begin not noticing certain things and lose your focus on what's important. Uncertainty and change keep you attentive. This place and, to a certain extent, my office, help me avoid developing habits. 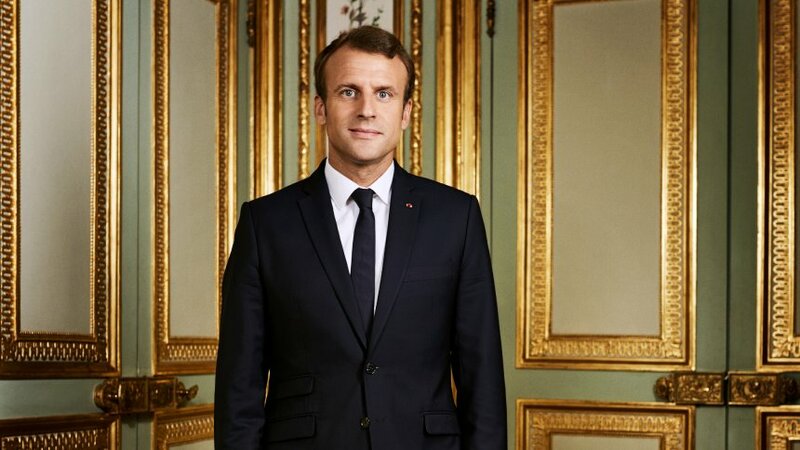 The function of president in France is one of significant symbolic value; it can't be compared with that of prime minister or cabinet member. Everything you do, everything you say - but also what you don't say - suddenly has meaning. That might sound quite formidable or even stressful, but I think it is a product of the history of this role. DER SPIEGEL: WHAT'S IT LIKE TO LIVE HERE? Macron: It is a place laden with history. The emperors spent time here, Napoleon I and Napoleon III. In the Fourth Republic, it was the palace of a president without powers. Only in the Fifth Republic did Charles de Gaulle move back in. It is a place where power has left its mark - over the course of centuries, ever since the revolution. You just sort of become part of it and continue the history. But, of course, there is a sense of gravitas. DER SPIEGEL: THAT SOUNDS A BIT SUFFOCATING. Macron: No, because you can leave this place when you want to. I go out and I say and do what I want - even if people may find that shocking. One could, of course, decide to be suffocated by all the pomp here. But if you decide to resist it, then you won't be suffocated. DER SPIEGEL: IT SEEMS YOUR PREDECESSORS WEREN'T ALWAYS PARTICULARLY SUCCESSFUL IN THAT EFFORT. Macron: What is clear is that being president is the end of innocence for you as an individual. Nothing is innocent anymore when you are president. And that changes your life dramatically. Normally, everyone can afford the luxury of doing things that make no sense. They do things, no matter what it is, and nobody cares. But when you are president, everything is significant, at least for the others. Everything is important and could even have profound consequences. That is sometimes troubling, yes. But it isn't overwhelming. DER SPIEGEL: DO YOU THINK THAT ANGELA MERKEL FEELS THE SAME WAY? Macron: Germany is different from France. You are more Protestant, which results in a significant difference. Through the church, through Catholicism, French society was structured vertically, from top to bottom. I am convinced that it has remained so until today. That might sound shocking to some - and don't worry, I don't see myself as a king. But whether you like it or not, France's history is unique in Europe. Not to put too fine a point on it, France is a country of regicidal monarchists. It is a paradox: The French want to elect a king, but they would like to be able to overthrow him whenever they want. The office of president is not a normal office - that is something one should understand when one occupies it. You have to be prepared to be disparaged, insulted and mocked - that is in the French nature. And: As president, you cannot have a desire to be loved. Which is, of course, difficult because everybody wants to be loved. But in the end, that's not important. What is important is serving the country and moving it forward. DER SPIEGEL: OFTEN, THINGS WORK QUITE A BIT DIFFERENT IN PRACTICE THAN IN THEORY, EVEN FOR THOSE WHO HAVE THOUGHT THROUGH EVERY STEP. Macron: That is true. You can anticipate and plan everything, but when you actually experience it, it's different. For me, my office isn't first and foremost a political or technical one. Rather, it is symbolic. I am a strong believer that modern political life must rediscover a sense for symbolism. We need to develop a kind of political heroism. I don't mean that I want to play the hero. But we need to be amenable once again to creating grand narratives. If you like, post-modernism was the worst thing that could have happened to our democracy. The idea that you have to deconstruct and destroy all grand narratives is not a good one. Since then, trust has evaporated in everything and everyone. I am sometimes surprised that it is the media that are the first ones to exhibit a lack of trust in grand narratives. They believe that destroying something is part of their journalistic purpose because something grand must inevitably contain an element of evil. Critique is necessary, but where does this hate for the so-called grand narrative come from? DER SPIEGEL: WHY IS THIS NARRATIVE SO IMPORTANT? Macron: I think we need it badly! Why is a portion of our youth so fascinated by extremes, jihadism for example? Why do modern democracies refuse to allow their citizens to dream? Why can't there be such a thing as democratic heroism? Perhaps exactly that is our task: rediscovering something like that together for the 21st century. DER SPIEGEL: You have been increasingly criticized in France due to your aloofness. You have been accused of arrogance and hubris. Macron: Who is leveling those accusations? The press. DER SPIEGEL: NOT JUST THE PRESS. Macron: Have you ever heard someone on the street say: "He is aloof?" Macron: I am not aloof. When I travel through the country, when I visit a factory, my staff tells me after three hours that I am ruining the schedule. When I am with French people, I am not aloof because I belong to them. My view is that the French president belongs to the French people, because he emanates from them. What I do is this: I am putting an end to the cronyism between politics and the media. For a president, constantly speaking to journalists, constantly being surrounded by journalists, has nothing to do with closeness to the people. A president should keep the media at arm's length. DER SPIEGEL: YOU RECENTLY HELD A CELEBRATED SPEECH AT THE SORBONNE ABOUT EUROPE IN WHICH YOU SAID YOU WOULD LIKE TO "REBUILD" EUROPE. Macron: Regarding the speech, I am quite modest about it. There has always been extensive talk about Europe. My initiative contains some new elements, but I also revisited ideas that have been around for a while and been proposed by others. DER SPIEGEL: MODESTY HAS THUS FAR NOT BEEN ONE OF YOU MOST NOTICEABLE QUALITIES. Macron: What's new is this: Since 2005, when the French and the Dutch voted "no" on a constitution for Europe, nobody has developed a real project for the EU. And certainly not France. If there were ideas, they came from Wolfgang Schäuble or Joschka Fischer, and these German ideas were downright quashed by France. I want to put an end to that. Perhaps I am following in the footsteps of Mitterrand, who really did want to shape Europe. My predecessors, by contrast, thought it was best to say nothing at all and to keep all their options open. That may sound like a tactical approach, but perhaps it was simply because they didn't have any ideas for Europe at all. DER SPIEGEL: YOU HAVE PROPOSED THE ESTABLISHMENT OF NEW INSTITUTIONS AND THE SIMPLIFICATION OF PROCEDURES. BUT ISN'T EUROPE'S PROBLEM MORE THAT EVERYONE SEEMS INTENT ON PURSUING THEIR OWN INTERESTS? Macron: What I am proposing is to start a new chapter in Europe. To begin this adventure anew, and differently, if you'd like. The institutions as such aren't particularly important to me - and I think most people feel the same. The problem is that debates over Europe have become disputes between experts and lawyers. Yet Europe was initially supposed to be primarily a political project! The EU never would have come about had it been up to experts or diplomats. It was created by people who had learned from the drama of our collective history. I am proposing a new beginning, not one in which it is first deliberated ad infinitum what instruments one needs, but one that follows from the goals we want to achieve. What do we want? What should our Europe look like? I want to renew the European dream and reawaken ambitions for it. DER SPIEGEL: WHAT DOES THE EUROPE YOU DREAM OF LOOK LIKE? Macron: For me, Europe consists of three things: sovereignty, unity and democracy. If we keep our eyes on these goals and work toward them together then - and only then - can we fulfill our promise: the guarantee of lasting peace, prosperity and freedom. Let's put an end to this European civil war, the existence of which we don't want to admit, and stop constantly looking at whether we are better than our neighboring country at this or the other thing. We have to be open to new things, and that includes things that have been taboo until now: France still insists that the treaties cannot be changed. Germany doesn't want any financial transfers. We have to leave these old ways of thinking behind. DER SPIEGEL: WHAT DOES THAT MEAN CONCRETELY? Macron: I think the goal should be that of creating a space that protects us and helps us survive in this world. The European community of values is unique: It combines democracy with the market economy, individual freedoms with social justice. How can we expect the U.S. or China to defend these values, this one-of-a-kind European balancing act that has developed over the course of decades? The challenges are manifold, issues such as migration or terrorism are important to us all. But the switch to renewable sources of energy must also be planned together. And last, but not least, there is digitalization and the societal change that goes along with it. We can only have success on all those fronts if we move forward together. DER SPIEGEL: HOW DO YOU INTEND TO DO SO? HOW CAN YOU GET THE EASTERN EUROPEANS TO GET BEHIND YOUR PROJECT, AND ALL THOSE COUNTRIES THAT ARE INCREASINGLY DISPLAYING NATIONALIST TENDENCIES AND THAT DON'T WANT TO HAVE ANYTHING TO DO WITH EUROPE ANYMORE? Macron: I don't think what you say is true. I was in Bulgaria in August. The people there are excited about Europe. We can't start dividing people up into categories. In the past, France has often committed the error of not speaking to everybody because there was a belief that some countries could be neglected. I am convinced that there is a desire for Europe. And by the way, who is to be blamed if that isn't the case? The Europeans. We have allowed the development of a kind of collective defeatism and are allowing primarily those to speak who hate Europe and want to give up on it. DER SPIEGEL: YOU ARE EXAGGERATING. Macron: I have often taken part in grotesque meetings as a sherpa. It was said there, for example, that summits exclusively for Eurozone members shouldn't be held because it could offend the British or the Poles. And what have we woken up to five years later? The British want to leave and the Poles are increasingly distancing themselves from Europe. That only shows that the more reticent one is with European ambitions, the less progress one makes. DER SPIEGEL: HOW IMPORTANT IS THE TRANS-ATLANTIC RELATIONSHIP WITH THE U.S. TO YOU? Macron: The trans-Atlantic relationship is strong and must remain so. The U.S. is an ally in the camp of freedom. On security and military questions, whether in Iraq and Syria or in Africa, we are closely tied to one another. But we have to establish a joint strategy on other issues, such as Iran and North Korea, but also on climate change. That's why I think it is important to speak at length with the American president and show him a path forward for possible cooperation. I feel an obligation to do so. DER SPIEGEL: DOES TRUMP MAKE YOU AFRAID? Macron: (Thinks for some time before answering.) Trump is here, he is the head of a global power. I speak with him and explain my views. We have an extremely cordial relationship. Sometimes, we have contradictory views but sometimes we agree. I won't stop working together with him. DER SPIEGEL: YOU SPEAK OF A UNITED EUROPE, BUT ONE GETS THE IMPRESSION THAT YOU ARE FOND OF TAKING UNILATERAL ACTION - THINGS LIKE INVITING TRUMP TO PARIS, OFFERING TO MEDIATE BETWEEN THE IRAQI GOVERNMENT AND THE KURDS FOLLOWING THE INDEPENDENCE REFERENDUM AND HOLDING AN IMPORTANT SPEECH ON THE FUTURE OF EUROPE TWO DAYS AFTER THE GERMAN ELECTIONS. Macron: Every country has its own diplomacy. Being part of Europe doesn't mean giving up one's independence or no longer being able to take the initiative. There are 27 of us - does that mean it is forbidden for some of us to be more ambitious than the others? No, otherwise stasis would be the result and we would be putting ourselves in handcuffs. For example, I often speak with (Turkish) President (Recep Tayyip) Erdogan. I have established a certain relationship with him and talk about it with the German chancellor. When I speak with the Turkish president, I defend European positions. That is how we European partners must do things. You also will have taken note of the fact that I intentionally avoided holding my Sorbonne speech before the elections in Germany. I coordinated closely with the chancellor and spoke with her at the end of the campaign and even on the evening of the election. She even received a copy of my speech before I delivered it. "Je ne suis pas arrogant" mais je sais exactement ce que je veux..."
It is only possible to know what to do in a specific moment once you have understood the zeitgeist, and it is only possible to move things forward if you have a sense of responsibility. And that is exactly the goal I have set for myself: to try to encourage France and the French people to change and develop further". You have to bundle the strength of those who want to take that step. The same is true for Europe." Being president is the end of innocence for you as an individual. But when you are president, everything is significant, at least for the others. "Don't worry, I don't see myself as a king. France is a country of regicidal monarchists. As president, you cannot have a desire to be loved. What is important is serving the country and moving it forward. I am a strong believer that modern political life must rediscover a sense for symbolism. We need to develop a kind of political heroism. I don't mean that I want to play the hero. But we need to be amenable once again to creating grand narratives. If you like, post-modernism was the worst thing that could have happened to our democracy. The idea that you have to deconstruct and destroy all grand narratives is not a good one. Critique is necessary, but where does this hate for the so-called grand narrative come from? I think we need a narrative badly! Why is a portion of our youth so fascinated by extremes, jihadism for example? Why do modern democracies refuse to allow their citizens to dream? Why can't there be such a thing as democratic heroism? Perhaps exactly that is our task: rediscovering something like that together for the 21st century. YOU SAID YOU WOULD LIKE TO "REBUILD" EUROPE. Regarding the speech, I am quite modest about it. There has always been extensive talk about Europe. My initiative contains some new elements, but I also revisited ideas that have been around for a while and been proposed by others. Perhaps I am in this following in the footsteps of Mitterrand. What I am proposing is to start a new chapter in Europe. To begin this adventure anew, and differently. The institutions as such aren't particularly important to me - and I think most people feel the same. Europe was initially supposed to be primarily a political project! The EU never would have come about had it been up to experts or diplomats. It was created by people who had learned from the drama of our collective history. I am proposing a new beginning, not one in which it is first deliberated ad infinitum what instruments one needs, but one that follows from the goals we want to achieve. What do we want? What should our Europe look like? I want to renew the European dream and reawaken ambitions for it. For me, Europe consists of three things: sovereignty, unity and democracy. LET'S PUT AN END TO THIS EUROPEAN CIVIL WAR, the existence of which we don't want to admit, and stop constantly looking at whether we are better than our neighboring country at this or the other thing. We have to be open to new things, and that includes things that have been taboo until now: France still insists that the treaties cannot be changed. Germany doesn't want any financial transfers. We have to leave these old ways of thinking behind. I think the goal should be that of creating a space that protects us and helps us survive in this world. The European community of values is unique: It combines democracy with the market economy, individual freedoms with social justice. How can we expect the U.S. or China to defend these values, this one-of-a-kind European balancing act that has developed over the course of decades? The challenges are manifold, issues such as migration or terrorism are important to us all. But the switch to renewable sources of energy must also be planned together. And last, but not least, there is digitalization and the societal change that goes along with it. We can only have success on all those fronts if we move forward together. I am convinced that there is a desire for Europe. We have allowed the development of a kind of collective defeatism and are allowing primarily those to speak who hate Europe and want to give up on it.